Ninety percent of all animal training, regardless of the species or complexity of the task, relies on a strong understanding of the science of learning. Learn what these foundation principles are and how to apply them to everyday training. By the end of this lecture, you’ll have the information you need to modify behavior in your dog or cat, as well as your horse, housemates, or even hippos! 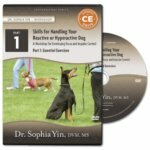 Understand the principles that guide learning in all animals so that you can apply techniques across species and situations. Learn the categories of operant conditioning and the foolproof way to categorize techniques correctly so that you can recognize when terminology is being used inappropriately. Discover how the approach of rewarding the behaviors you want (positive reinforcement) and removing rewards for unwanted behaviors (negative reinforcement) can be used to solve most non-medical behavior problems. Understand that training is a technical skill. See how subtle differences in timing, rate of reinforcement, choice of a motivator, and the ability to define appropriate criteria can make vast differences in your training efficient. 96 min / 2 units.